OpenLM is a licensing management software company with an international install base. OpenLM’s focus is on adaptable Software Asset Management (SAM) solutions, for a variety of license servers, and company sizes. Companies that use OpenLM’s software range from global corporations and nation-wide companies to small offices. Our company’s commitment to innovation guarantees that our clients constantly receive updates with the most advanced technology. OpenLM’s Software provides a comprehensive management solution for license management software such as FlexLM and DSLS. The complete list of supported license servers is found here. The software provides productivity tools for system administrators, managers and end users. 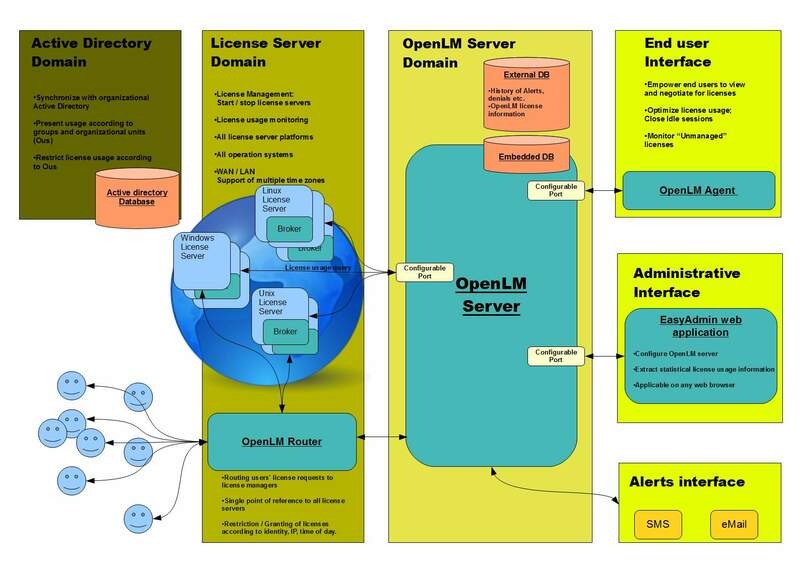 OpenLM’s software supports the major trends in the field of license management, e.g. : license consolidation, Usage chargeback (usage billing), usage trend analysis etc. The software provides a comprehensive solution that combines the best of breed software, superior support, implementation and consulting services, in order to ensure your success. OpenLM is a business partner of ESRI. OpenLM’s solution can be tailored to the customer’s needs, optimizing the licensing system and increasing software productivity. OpenLM’s basic software package includes the core OpenLM Server module and its user interface; the OpenLM EasyAdmin module. In addition to these core components, the OpenLM Broker and the OpenLM Agent modules are incorporated in the basic software package, but their installation is not mandatory; The Open LM system can function without the use of these two components. Others require the installation of an additional software module. The OpenLM Server is the core element of the OpenLM system. It integrates the functionality of all other peripheral system components, such as the OpenLM EasyAdmin, OpenLM Agent, OpenLM Alerts, and OpenLM Broker. It is responsible for collecting information from various system components and storing it in an embedded relational DB. External databases like Microsoft SQL Server and MySQL starting with 2012 version are also supported. The OpenLM Server is implemented as a Windows service and can be installed on any network machine. It enables monitoring and managing of multiple license servers, over LAN or WAN networks. Common OpenLM Server configurations may vary from one or more license managers nationwide to multiple license servers located worldwide, over different time zones. EasyAdmin automatically extracts statistical license usage information from all attached license servers. EasyAdmin’s role-based security enables system administrators to grant varying degrees of access to different groups of users. EasyAdmin runs on all modern web browsers including Google Chrome, Firefox and Microsoft Edge and can be accessed from any machine in the organization. EasyAdmin features a touch interface that is compatible with mobile operating systems like Android, IOS, Blackberry and Windows Mobile. The OpenLM EasyAdmin Mobile application is particularly useful for after-hours crisis management situations. EasyAdmin’s streamlined user interface design promotes simple and effective use of its unique capabilities. Query License usage information locally on the License Manager machine. Push this information to the OpenLM server. Obtain license usage and license denial information from the License manager’s log file, and push it to the OpenLM server. Support complex configurations, e.g. license servers that work over WAN networks. The Broker is an independent java based software module that can run on any license server operating system: UNIX, Linux or Windows. For more information please refer to this article. The OpenLM Alert is a dedicated alerting service for the OpenLM system. This module alerts system administrators when predefined conditions are met. Alert service users can set complex alert conditions on multiple license servers. For example, if the combined usage of a certain feature on servers A and B is above a certain threshold, an email message will be sent, alerting those concerned to the situation. The Alert service also supports adjustable timing for alert checking and message sending. Alert destinations are also configurable; Alerts could be sent to the EasyAdmin interface, over emails, as SMS text messages, or directed to a system event log. Check which users are holding required licenses. View a user’s full set of details as they appear on the LDAP, and communicate with users regarding license availability. Receive license availability notifications as soon as requested licenses become available. Report the session’s active project (mainly for billing purposes). OpenLM’s Active Agent extension allows system administrators to define a timeout policy. In this manner, system administrators can save, close, or suspend idle applications, in order to make more efficient use of licenses. The Active Agent features a user-friendly interface that enables users to quickly reopen closed applications, or resume suspended ones. Applying rules and restrictions on license usage according to specific users, IP ranges and time of day. These rules may be applied to any type of license server. Setting up a license server redundancy scheme. This extension facilitates saving license usage information on an external Database such as an MySQL or MS SQL Server starting with 2012 version. By default, OpenLM uses an embedded Firebird DB. External DB support is recommended for management of large licensing systems. This extension enables collecting license usage information from Groups of users or projects. This capability is predominantly used by companies that charge back usage time to cost centers. The Groups & Projects extension synchronizes users’ data with its LDAP Database (Active Directory), keeping the data collection process fully automatic. 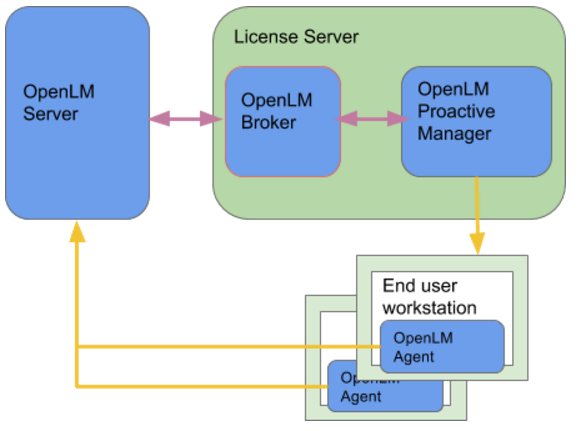 The OpenLM Server supports a role-based security feature that enables the implementation of customized access to OpenLM tools by setting access roles. This feature facilitates the implementation of OpenLM tools for diverse groups; e.g. : help desk, system administrators, managers and developers. The role based security system secures nearly all parts of the system entities, such as listed servers, fields and action buttons. The OpenLM Option File Management extension employs LDAP (Active Directory), to enable system administrators to manage Option Files easily from the EasyAdmin web based interface. This gives the system administrators easy control over the access of user groups and individuals to licenses.